With PC hardware and software companies still struggling to update systems before any Meltdown and Spectre exploits are found in the wild, wouldn't it be interesting to have a quick check to see how many of these background system updates had progressed so far? 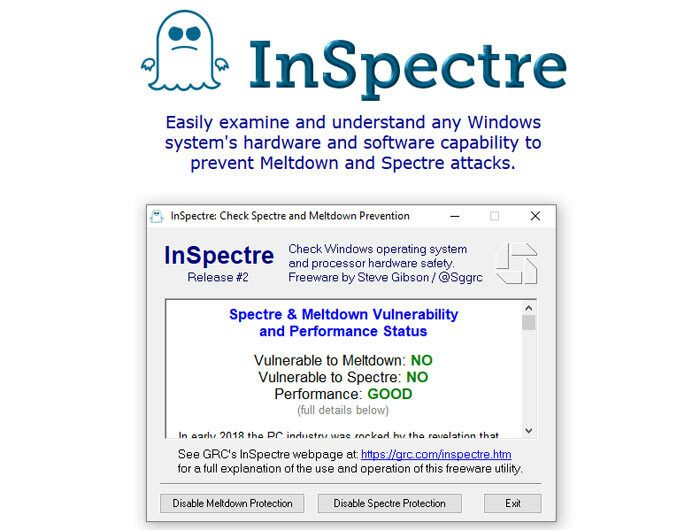 Now Steve Gibson, of SpinRite fame, has released a quick and easy tool to check your PC for Meltdown and Spectre vulnerability. It is called InSpectre. 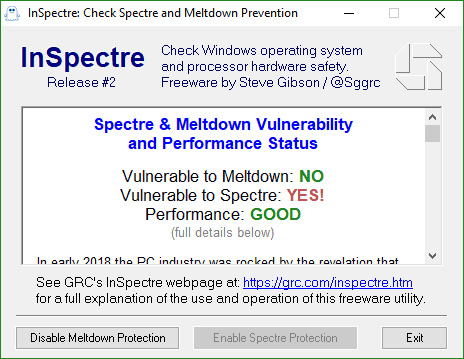 On my desktop PC I was pretty sure that the Meltdown patches had arrived via Microsoft's automatic updates but I knew that Spectre was still going to be an issue due to my Gigabyte Haswell motherboard. Gigabyte isn't even thinking about such old platforms right now (but neither are Asus or MSI). Meanwhile, some Haswell and Broadwell systems that have been updated have demonstrated stability issues. The above is much more straightforward than checking through update history to see which CVE XXXX-XXXX patches I have had applied and checking if they correspond to Meltdown, Spectre Variant 1, or Variant 2. Under the headline info you can see within the app window above, you can scroll down to a more wordy description of your current system state. In my case it says that my 64-bit version of Windows has been updated for both Meltdown and Spectre but the hardware has not been updated (via BIOS) to close down any Spectre vulnerabilities. Further info suggests my Haswell / Win 10 system performance won't suffer significant slowdown, even with the BIOS update. InSpectre has been carefully tested on many different systems and scenarios but is still quite new. Currently it is at release version 2 - an update was made so that it wouldn't trigger false-positive warnings from 3rd-party anti-virus scanners. Interestingly InSpectre, when run with Administrator privileges can toggle the Meltdown and Spectre protections on and off. A system restart is required to apply the change(s). This feature could be good for those interested in comparative performance testing and so on. You can read more about InSpectre on the official GRC site and direct download links to this 122k assembly language app are available there too. Please note that this is a news article, not any kind of recommendation that you should download and run the GRC InSpectre tool. Windows 10 updated to enable USB 'Quick Removal' default Windows 10 May 2019 Update - users get more control PC Specialist Vortex S1 Microsoft intros slimmer and lighter modular Surface Hub 2S Has Samsung been chosen for Intel Xe GPU manufacturing? Assembly? Wow, the authour should apply for a job with NASA. They're struggling to find people to send updated code / instructions in assembly to the Voyager probe as all the people who coded it are either dead or retired. Can't imagine my super old but great b85 board will have any updates. Obviously since its a laptop, no bios updates.